Aftelier Natural Perfumes: New Website + Giveaway to Celebrate! Mandy Aftel, founder and creator of Aftelier Perfumes is a busy gal. She writes, creates gorgeous scents, collaborates with chefs, and has just revamped her website. The above image is from her art collection and greets the visitor at the Aftelier homepage. Mandy’s new site is visually lovely with beautiful art and stunning images of her products. The best part of the website is its elegantly simple design that makes it so easy to navigate. At the left of every page, you’ll find a list of the website’s pages such as liquid perfumes, solid perfumes, perfumed teas, and my favorite, the samples page. 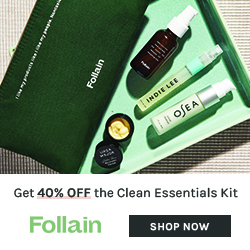 Since the Aftelier website is much more user-friendly, it’s far easier to discover all of Mandy’s previously hidden gems like the Face Elixirs, found at the Face-Body-Bath page. I have the Violet Leaf, Neroli and Chamomile Face Elixir and I use it as Mandy suggests, which is to apply it to my clean face before bedtime. The Violet Leaf, Neroli and Chamomile Face Elixir smells exceptionally leafy thanks to the violet leaf absolute. I find this essence to dominate the Face Elixir with its damp earthy greenness. 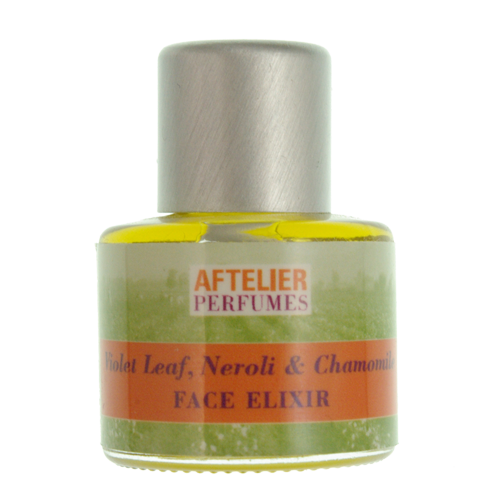 Neroli gives the slightest hint of citrus and the chamomile boosts its herbal tones, but violet leaf is the heart of this Face Elixir. The 7ml bottle is a petite thing, but I find I need only a drop or two added to my nighttime moisturizer of choice, typically Kahnia Giving Beauty’s Organic Argan Oil, for an aromatic lulling to sleep. Another tiny bottle that packs a wallop is Aftelier’s Bath Oil. I’m used to bath oils in large bottles, so when I first laid eyes on the diminutive 15ml bottle, I was taken aback by its size, but once I learned that these Bath Oils are made only with pure essences and no carrier oils, the dainty size made perfect sense. The Bath Oils have droppers to ensure you’ll never use too much in one steeping. And believe me, one dropperful is all you need to create an unbelievably redolent bath. Mandy recommends adding the bath oil after your bath is drawn rather than under running water since the natural essences volatize immediately when exposed to hot water. After I squeezed my Forest Flower Bath Oil dropperful into the tub, the entire bathroom was filled with the camphorous and piney trail of Black Spruce essential oil. Relaxing in a Forest Flower bath soothed my sore muscles, and replenished my mind with a calm energy. You all are probably wondering about the giveaway part of this post, so let’s get to it. There will be four winners in this drawing, and each winner gets to pick out one of the following: a Face Elixir, a Bath Oil, a Body Oil, or a perfume Mini (except Parfum Privé). You need to do two things to be entered, so read carefully! 1). Go to the Aftelier website and give a little feedback in your comment about the new design. 2) Let me know what item you want if you are one of the winners. You can get extra entries if you follow Mandy at Facebook or Twitter. 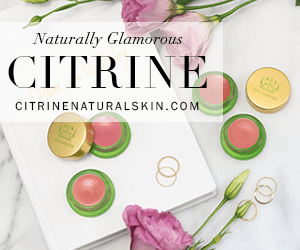 Extra entries as well if you follow Scent Hive on Bloglovin, Twitter, Google Friend Connect,Facebook’s Networked Blogs, or subscribe to Scent Hive. Please let me know in your comment what you did so you get the entries you deserve! Drawing is closed, we have our winners! Here are my past Aftelier reviews if you need help picking out a fragrance. Please visit CaFleurBon, Now Smell This, The Non Blonde and PerfumeShrine for more celebration of Aftelier’s new website. Next Post The winners of the Aftelier giveaway! Of course, I had already browsed Mandy’s new site, but the new design makes everything look even more lucious (sp?). Everything is easier to find now, and not buried many levels down. I lust after the jade case, and the art deco case, preferably filled with Privee. Details: I follow both of you on twitter, and would be most partial to the Shiso mini perfume. 2nd choice, the resurrection bath oil. Nice to ‘see” you and I will be really seeing you soon. I would love a perfume mini of either Pink Lotus, Cepes and Tuberose, or Shiso… sigh really anything from Mandy would be treasured like gold! Thank you for pointing the out the price difference about he samples. We will fix that right away. Thank you for your kind words and careful reading of the site — I really appreciate it. Great idea to have a page that lists all of the fragrances and their notes. I’m sure Mandy will be reading all of these comments, but I’ll drop her a line about the price difference on the samples. The new site looks great. It’s brighter and the product photos stand out more. The images work really well with the site too. I’m already following Scent Hive & Mandy on twitter and facebook. If I won I’d like to try one of the perfume minis: Lumiere, Tango or Linden Blossom. Actually any one of the perfume minis would be great lol. I do like the new design a lot, and your comments are spot on. The site is crisp and it is a lot easier to browse through the different — as I like to do from time to time! The FAQs are helpful, and I can’t remember if I used them before…but they are easy to find now! I follow you and Mandy on Twitter and Facebook already. 🙂 I’d love to try Tango in perfume or bath oil form. Thanks! That makes 5 for you! Nice comments too. Hi Trish, what a lovely giveaway. I was toodling around Mandy’s website just this week and loving all the pictures! The site is so easy to follow and the layout bright and inviting [the Aftelier website has always been inviting…. *grin*]. I follow Mandy on facebook. I follow Scent hive on Bloglovin, Google Friend Connect, Facebook’s Networked Blogs, and also subscribe to Scent Hive. Hi Trish–great post today, I love Aftelier. I bought a little set several years back (Cacao, Pink Lotus, and Maroc) thru beautyhabit.com, and cherish it still 🙂 The new website is GREAT! I like how all the samples are right on one page so you can check off what you want and add it to your basket. It is also really simple now to find something that you just read about and check it out, and the photos and product descriptions are very clear and attractive. My choice if I won would be a mini Fig Perfume. I follow you on Google FriendConnect, Facebook, and I subscribe to scenthive.com as well. Thank you!!! love your feedback! that’s 4 entries for you. Can’t wait to check it out! Just visiting these sites makes me feel like I am traveling to exotic places. Let me know when you check it out and how you like it. Also what product you would want if you win! Let’s see! I follow Mandy on FB I follow you on Bloglovin, Twitter, Facebook and I am a subscriber. Trish, this is very hard for me to decide!! But I think Lumiere Mini sounds too stunning to pass up! This will be my pick if I am one of the chosen. Decisions, decisions!! Good luck, you’ve got 6 entries. Thank all of you for all your wonderful comments about the new website. I am so happy to hear them! Thank you Mandy and Trish for such a generous, lovely giveaway! I had never seen Aftelier’s former website, but I agree with all of the previous comments that it’s very well organized and easy to use. I love the samples page as well, and will definitely be trying out some of those soon! If I were to be lucky enough to win such an awesome giveaway, I think I would be most interested in trying the Fresh Ginger and Lavender body oil–sounds divine! I follow Mandy on Twitter, as well as subscribing to Scent Hive, and following you on FB and Twitter. Thanks again! Mandy’s fragrances are a must-try! 5 entries for you! Fabulous choices of Tango and the Chocolate Saffron Body Oil. I don’t know if I could decide between the two either, they are both so wonderful! I’m dreaming of that body oil! Of course I’m subscribed to your blog as well ; ) Have a great weekend! Oh no Trish 🙂 Well here we go again! I get confused by this at times but yes I “follow” you and Mandy on FB. I am also friends with you both on there too, I also follow you on Googleconnect and subscribe to Scenthive. And I also commented Mandy’s site. Wheeeeeeew! I have been meaning to get a hold of that Chocolate Saffon Body Oil<3 Mmmm . My but you are a busy girl, thanks again for the chance to smell something new and wonderful Trish, take care! The new website if sooo easy to navigate and the introduction painting is spectacular. I like it enough that I would hang it in my home! I really like the way things are laid out with clear photographs and descriptions of each item. Someday, I want a personal consultation to get my own perfume made for me by Mandy. In the meantime, I’d like to win the Fir/Roses solid perfume as my first choice and second choice is the Chocolate/Saffron Body Oil. I forgot to mention that I follow Mandy on Facebook and Scent Hive now on Facebook as well. Sadly, I don’t tweet. Deborah, a custom perfume from Mandy would be dreamy! I find the new website much more user friendly but not as dynamic. Aftelier is a leader in the industry and the site could better artisticly represent that. The use of white is clean and simple, and I appreciate seeing product pictures, but the artwork at the top with visable type is distracting. If I’m chosen, I would love a Capes Tuberrose mini. Interesting feedback Alice, thank you for that. And you picked one of my favorites, Cepes and Tuberose, it’s amazing. Oh. My. Gaaawd. There is a Fir/Rose solid?????! I want that! I think I’ll torture myself and still get a sample of them. How cruel I'm not a millionaire, guess I'll have to just go run in mine with a rose perfume on..wait I'm already wearing Parfum Sacre! So many lovely scents right? Have you tried Mandy’s Fig? Fir-Ever Young and Fig are very similar. But, your above choice of the Chocolate and Saffron Body Oil is a good one! Hey girl hey, I left a comment about this on your old post – Fig edp. Fingers crossed for you mama! I love the new layout of her site. It’s much more accessible. The pictures of her products are just gorgeous and they so perfectly compliment the rich jewel toned colorscheme. Absolutely covet-worthy. I think if I won I’d choose the Cacao mini perfume. It sounds so decadent! So true about the jewel tones which really capture the feel of Mandy’s fragrances. I have yet to try Cacao….but really want to! Thanks for the follows, that’s 6 entries!! Hello! I haven’t visited the Aftelier website before so I can’t compare but will offer a few comments from a fresh perspective! I think it is very easy to navigate – found exactly what I was looking for quickly. Also liked the separate page for samples, that was easy to find (I noticed there was no sample listed for Blond Tabac perfume or maybe I missed it). I may try some of these out since they sound so delightful! The white background keeps it clean and easy to read. I think a different font might make it more interesting – or having one main font. The logo, links at the top, and links at the left are very different fonts – especially the logo (top left). I alos would like one page where the different fragrances are listed with notes instead of having to click on each one. I’d love to be entered and would like a perfume mini – I haven’t tried any so am having such a time deciding – Lumiere, Blond Tabac, Cognac and Tango all sound wonderful! Oh, the new site is lovely. I adore the art work, and the site is easier to navigate. Everything seems more open. I would love to try the rose, sandalwood and frankincense face elixir-sounds divine! I follow Mandy on facebook and twitter and scent hive on twitter. Thanks! M, The artwork really adds a special dimension to the website doesn’t it? I love Mandy’s new site! I discovered some things I never knew were there before just because it’s so much easier to navigate. I also love the photos on the site. Overall, a great design! I do agree with Monica – I would love to see the fragrances listed by their notes as well. If I win, I would love a Tango mini. I follow Mandy on Facebook and Twitter, subscribe to ScentHive in Google Reader, and follow ScentHive on Twitter. Mandy will be so pleased to read your comment. This is exactly what she wanted, to make it easier to discover all of her offerings. Beautiful site! I would enjoy reading feedback from customers about the various scents, because sometimes it helps me choose what I might like, so I guess that’s my suggestion. If I win, I would love a Cognac mini. I follow Mandy on Facebook and Twitter and follow ScentHive on Twitter. I have to agree- the new website is easier to navigate and more spare and visually ‘easier’- if that makes sense. I have lusted over products on her old site- so I do love the old one too as I associate it with my initial foray into the world of natural perfume. Though right now I am actually more in the mood for Tango with the champaca and choya nakh- I really must sample Mandy’s scents again- it’s been so long. Thanks for commenting L!! I love Shiso, it is so interesting and lovely. It’s obvious a lot of thought has been put into the website to make it easy to navigate and read, and be pretty. I like it – it’s tidy but not empty. All round aesthetically pleasing. I’m following Mandy on Facebook. Would be marvelous to have a mini of Tango! So that’s 2 entries for you. Oh, I think the design of the site is quite nice. It’s easy to navigate around, and texts are very well readable. The product pictures and the like are placed really nicely and the size of those pictures is also good. The site feels very “open” and it’s not stuffed – it makes it enjoyable to browse. On critical note, I’d say that I don’t quite like the fonts. The font used mainly is a bit heavy … a different font could make reading a bit easier. The another thing that bothered me was the way colors were used on links. I can’t see straight away which of the texts are links and which aren’t… Say, most of the links are green, so whenever I got across green text I tried to click it – just to find out it wasn’t a link. Thanks for the constructive criticism. I know Mandy is reading the comments and takes them to heart. Beautiful, beautiful, beautiful……I feel a little dizzy with desire for so many amazing Mandy creations…the website matches the artistry of her products…I love the pictures from Grasse! I follow Mandy on Facebook and am subscribed to the Scent Hive. If I win i would like the violet leaf face oil or the Rain bath oil!!!!!!!! Thanks for commenting, you’ve got 3 entries! This was my first time visiting the Aftelier site, so I can’t speak to the differences, but it seems to be very well organized and easy to navigate! 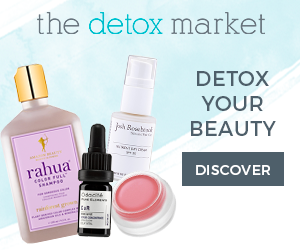 I would love to get the Geranium, Jasmine and Ylang Ylang Face Elixir, it sounds divine! I follow both of you on Twitter (@TheGreenBirdie) and I’m an email subscriber of Scent Hive. i love the new site, everything is right there and easy to find and buy. much more user friendly than before. and dangerously easy to find something i want to try! i follow scenthive on twitter and FB, also aftelier on FB. i’ve just frinded you on FB, which doesn’t count, but i love your blog and am more apt to see thing on FB. i’d be thrilled with a bottle of rain bath essence, or drop of parfum prive, or a chef’s esence in rose, nutmeg, jasmine, most anything! So glad you like the new site, it is indeed easier to do damage, right? Especially with that samples page! Thanks for all the follows, that’s 4 entries for you. So true! I love Pink Lotus as well, nice choice! Amazing website!! I love it! Gorgeous AND simplistic. The artwork displaying the antique perfume bottles and the pictures of Mandy in her studio for the custom perfume page are all so lovely. If I won, I would love to get my hands on that Pink Lotus mini! I read everyone’s comments an I thank you so much for all of them. We are going to make a few of the changes that you suggested which I think would improve the website. It made me so happy to hear all the positive comments you about the new website. Thank you ! I really hope this doesn’t disqualify me, but… I can’t say as I see a big difference from the older site. Slightly easier to naviagate, maybe. Oh well. Nonetheless, I’d really love a mini of Shiso. Certainly not! All comments are welcome. The new website is great, easy to navigate and is also very good in terms of search engine optimization! Thats important today, so many new natural perfume lovers will find Mandy, I m sure! I follow Mandy on facebook and twitter. I follow Scent Hive on FB, twitter, google friend, bloglovin and I subscribed. I counted 8 entries for you, thanks!! Thanks so much for the follows, that’s 8 entries….yay! I’ve been following Mandy’s work for years and was just introduced to your blog and added it to my reader. Thanks for hosting the give-away , I love Mandy…!! Love the new site! Very clean & easy to navigate–and I really like the clean pix of the products on white background. Images were a bit slow loading in my Firefox browser, but not bad. I would love to see even more historical images/manuscripts/recipes–I love that stuff! Thank you for the new comments today. Thank all of you and Trish for taking the time to do this. We are working on making the pictures load quicker so it won’t take as long but still have high-resolution pictures. I am excited to see who wins. It is very meaningful to me to hear what you like about my perfumes and which are your favorites. I love Mandy’s new site because it’s so much easier to find things. Having the pictures of the items on the site is a real plus. Now I can SEE the essential oils or absolutes before I buy them. If I had a complaint it would be about the font used on the Home Page. If a serif font is going to be used, could the size be bumped up a little, or perhaps a sans-serif font would make the smaller letters easier to read. My laptop has a small screen so I looked at the site on a larger monitor and I still would like to see the Home Page fonts a little bigger. I am very much looking forward to the online classes in the fall. I took Mandy’s perfume class at Esalen several years ago and she is a wonderful teacher. I would love to have either the Lumiere, the Boronia Solid Perfume or some Flouve absolute. I would love to take Mandy’s workshop at Esalen. I hope to someday. Thanks for the feedback and good luck in the drawing! In a word, Mandy’s new website is – divine! The aesthetic captures the essence of Aftelier’s exquisite products, from the antique cases to the luxurious fragrances crafted from scents that have been used in perfumery for ages. Navigation is smooth and intuitive, which is wonderful, and the website showcases Mandy’s fabulous work. I have been a fan of Mandy’s creations for many years now and it’s wonderful to have watched her product line evolve and expand and now, to see the website transformed is lovely! If I were lucky enough to be selected, I would absolutely love one of the facial elixers – specifically the Rose, Sandalwood, and Franckincense. I’ve wanted to try them since they came out, they sound so luxurious and wonderful! Thanks for the opportunity to post feedback on the site! What a pleasure to explore it! Love her website. I like the purple and the great artwork. Would love the fresh ginger and lavender body oil! Follow YOU on facebook 🙂 Also subscribe to your blog through google reader (don’t know if that counts) Also just followed Mandy’s blog via facebook. I know, the art work is so pretty and makes the website unique. The images are from Mandy’s antique postcard collection I believe. Good luck in the drawing, nice selection with the ginger body oil!! Mandy love the site! Everything is so easy to follow and find. You needed a change to fit with your success and hard work. I know that all of us have been inspired by you and your writings. I absolutely love the photos. Very user friendly. Great job. Follow you both on fb and twitter, and email from mandy. Would love a mini tango. Thanks so much for the follows Sandy. That’s 5 entries! I am a longtime admirer of Mandy Aftel’s creations from the days of Grandiflorum. The site is a delight and nicely laid out. My choice is a Cognac mini. Trish, what a lovely way to celebrate Aftelier’s new web design. I find the new site easier to navigate, with like items together. I also never knew she carried bath and body products — are those new with the relaunch? If I were to win, I’d choose a mini perfume of Shiso! I follow Mandy on FB and Twitter and her email list and follow Scent Hive in every way you have listed. Thanks!